Waiting for the snow covered road to be plowed and cleared takes patience. Dealing with the plethora of potholes that follows the snow takes not only patience but skillful navigating and being circumspect. This year, in the city of Philadelphia and nearby areas the potholes seem insurmountable. Nevertheless, they do serve a genuine purpose. Potholes force us to slow down and pay close attention to our surroundings. Sometimes, we’re driving along, and the car in front of us may swerve to avoid a pot hole. Not paying attention and failing to do the same could result in a blown out tire or even an accident. Going the speed limit is fine, but potholes force us to use common sense. 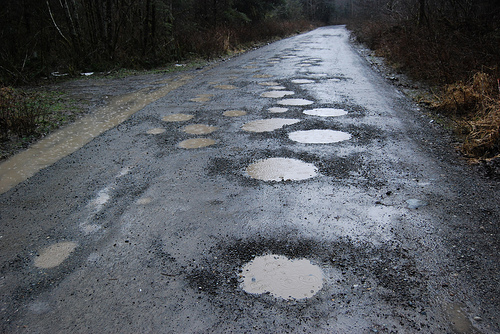 If there are a series of potholes, switching lanes or decelerating is necessary if you do not want to ruin your shocks. These potholes represent more than just a nuisance; they are an analogy for those moments in life when we need to be attentive or risk sustaining damage to different aspects of our lives. When we are speeding along, they slow us down and give that jolt we need to keep going on.